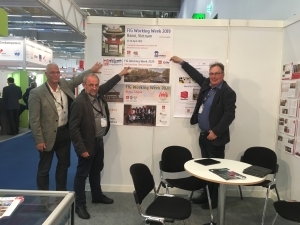 Frankfurt was host of Intergeo 2018. 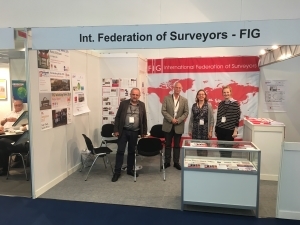 FIG President Elect Rudolf Staiger represented FIG in the official opening and throughout the three exhibition days. 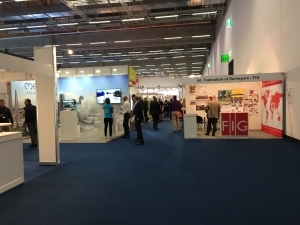 Intergeo took place in the newly built hall 12 of the large conference and fair area in Frankfurt and attracted almost 650 exhibitors and 19,000 visitors. 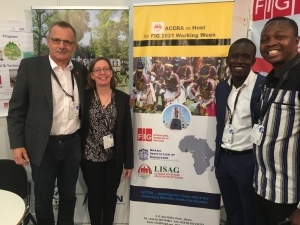 FIG was also attending with a stand, manned by FIG office, Louise Friis-Hansen and Claudia Stormoen together with the host of FIG working Week 2020, Amsterdam, and FIG Working week 2021, Accra, Ghana. The overall theme of Intergeo 2018 was “Geoinformation — The DNA of digitalization” with a focus on the digital transformation of business and society. In the opening President of DVW Hans-Jürg Kutterer said that digitalisation is turning our industry upside down and we can either take note of this or play an active role in the process. He continued pointing out that our awareness of the wide-ranging facets of digitalisation will play a key role in its development. Hagen Graeff who is also well known within FIG noted that "we are now talking about "diGEOtisation"" and not only digitalisation. 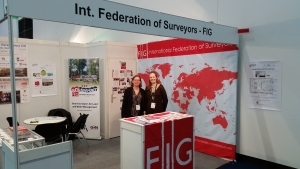 Frankfurt proved the ideal international place for the trade fair that showcased a variety of UAV's, drones and digital equipment showing an interesting future for the geospatial profession. 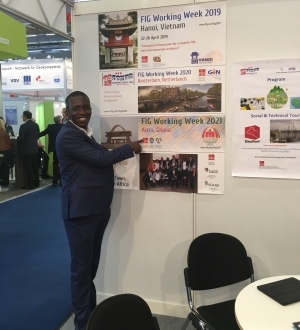 Many both known to FIG and others came by the FIG stand at the first floor in Hall 12 showing interest in the future FIG Working Weeks in Hanoi, Vietnam 2019, Amsterdam, the Netherlands in 2020 and Accra, Ghana in 2021. 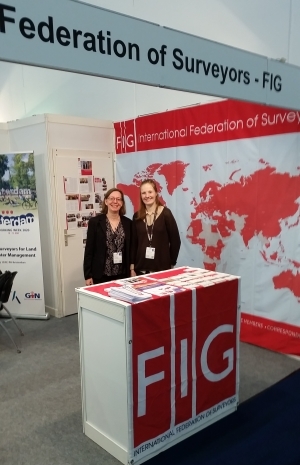 From several of te other exhibitors there was also an interest in FIG as Federation and corporate memberships. FIG and the local organisers from the Netherlands. 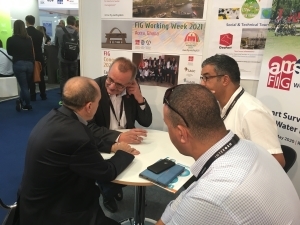 FIG President Elect Rudolf Staiger had several meetings during Intergeo with FIG members - here with representatives from Algeria.